Michael Bisping could face a lengthy absence if his eye issues continue. Michael Bisping’s immediate MMA future could be decided in the next 24 hours. The UFC middleweight has developed a cataract in his injured eye and has an important eye test Thursday morning in London, UFC Tonight’s Ariel Helwani reports. If the doctor clears him to fight, he’ll be ready to return to the Octagon. If not, it could extend his absence from the UFC for a long time. 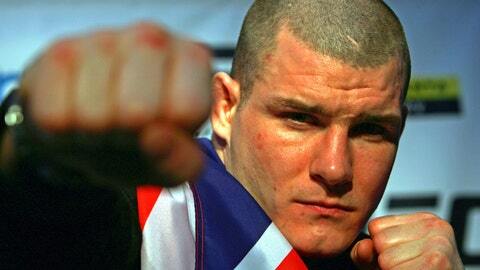 Bisping, the No. 5-ranked middleweight in the organization, will take a field depth perception test and general periphery test, according to Helwani. There will also be another separate test. The cataract is in his right eye, which he injured in training back in the fall. The injury forced him out of a UFC Fight Night bout in October against Mark Munoz. Bisping, 34, is targeted for an April 16 fight with Tim Kennedy, which would be the main event of the TUF Nations Finale in Quebec City. Luke Rockhold – and almost every other middleweight in the UFC – has challenged Bisping to a fight. The Brit hasn’t fought since beating Alan Belcher by decision in April 2012 at UFC 159.